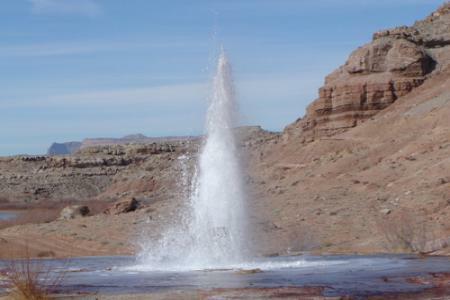 The Crystal Geyser trail will begin in Moab and finish near Green River for the convenience of those departing in that direction. The trail locale is south of Green River Township and east of the Green river. The country is colorful and beautiful in a desolate way. The route passes near Dubinky Well and the "rainbow rocks" country on the way to Salt Wash, Little Grand Wash, and seldom used mining trails through the stark slopes of the Morrison formation. 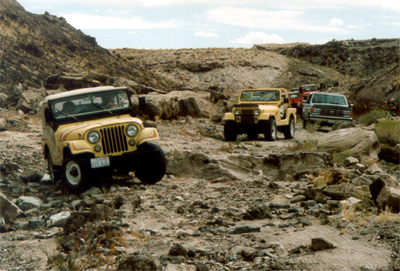 Most of the trail is quite easy, but a few gullies and rocks could trap vehicles with poor clearance. The always beautiful Entrada sandstone layers are especially colorful in the Rainbow Rocks area. The Morrison slopes are fully as colorful, but the soft material supports few sheer cliffs. Those of us who have never been on the moon suppose it might looke like this - but with less color. The sandy roads near rainbow rocks yield to dry-weather-only clay and shale residues later in the trail. There are some rocky wash bottoms and numerous cross-cutting gullies. Short, steep climbs near rainbow rocks and Duma Point will test some stock vehicles. The old mining roads nearer Green River have accumulated some sizable rocks that will cause everyone to watch wheel placement and fear for low-hanging parts. Crystal Geyser is one of the region's several man made bore holes that tap cold water and CO2 to yield occasional, but spectacular, geyser action.